You read enough recipes and it becomes second nature. 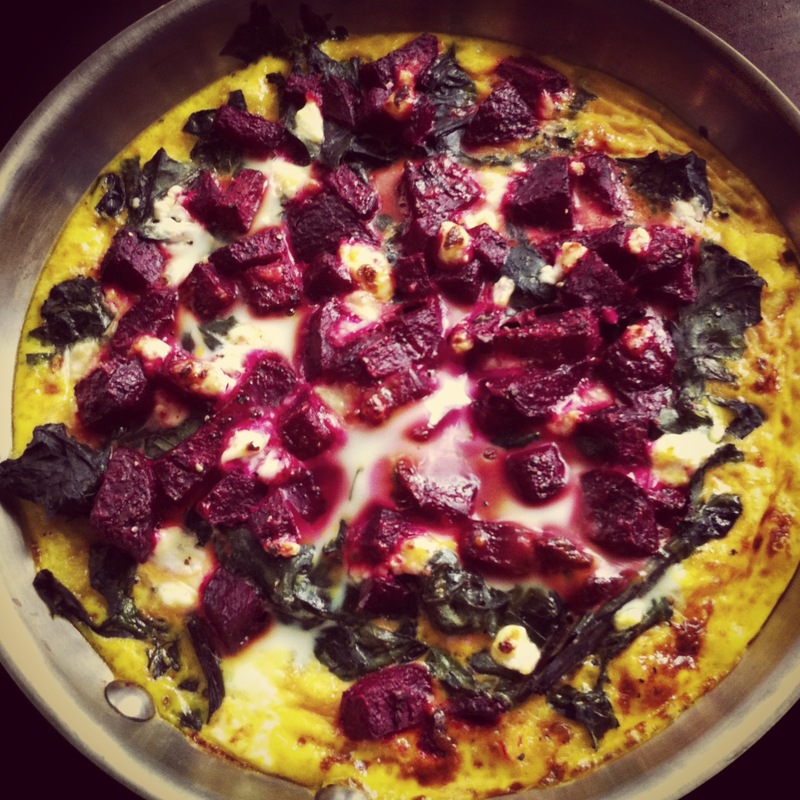 You just know certain things work well together–like beets and goat cheese. So you walk into the kitchen with a vague idea of what you plan to do, but then, as you get going, you let your instincts take over and you just enjoy the ride. Beets are washed, wrapped in foil, and put in the oven to roast. Chopping garlic scapes, you feel compelled to toss a handful of them into the creamy polenta cooking (too quickly!) on the stove. After stirring in the garlic scapes, you scoop the polenta into a pan and move it to the oven to cook more slowly. Turning your attention to the mess of beet greens, you decide they would be best if cooked down, so you set about washing and chopping them. As the timer alerts you that the beets have finished roasting, you contemplate the options of how best to use the yummy tahini dressing you just made, now that the greens will be cooked down. Drizzled over top perhaps? 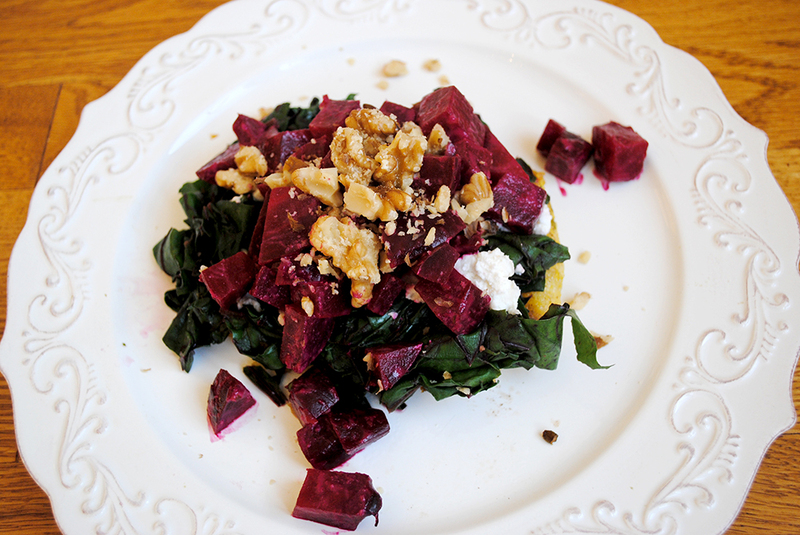 No, you decide, tossed with the roasted and diced beets! Removing the polenta from the oven, you cut it into six squares, and remove one to be pan seared, creating a nice and crispy cake. You toss the greens into the pan, working quickly to pull it all together after what has been a quite laborious process. 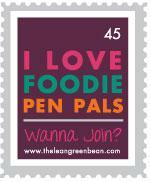 Greens ready, you begin to layer your creation. You grab a few from the bag your purchased just this morning, crumble them in your hand, and scatter them over the top. Prepare the beets: Thoroughly clean each beet, and wrap, individually, in foil. Roast in a 375 degree oven, about 45 minutes, until tender when pierced with a fork. Once cooked, open the foil and allow the beets to cool. Run under cool water and use your fingers to peel the skin from the beets (it should be very easy to do!). Dice the beets and set aside in a bowl. 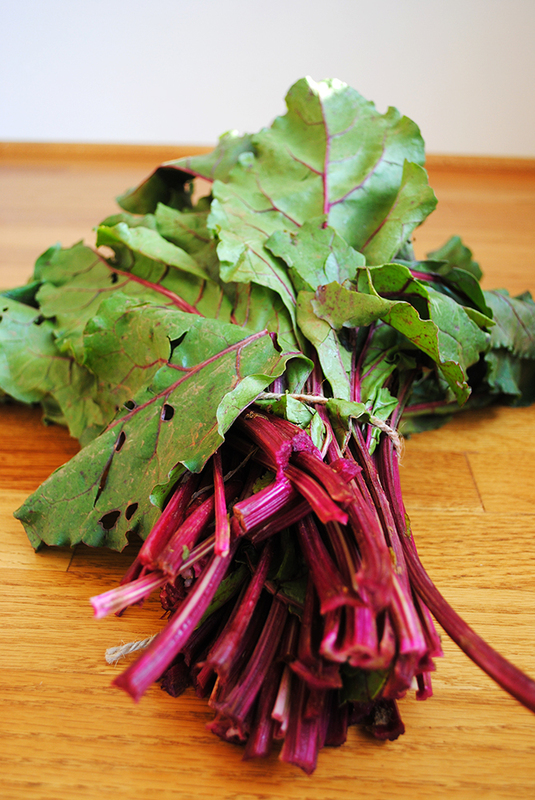 Wash and coarsely chop the beet greens, discarding most of the stems. Set aside. Prepare the Polenta: Bring 3 cups of lightly salted water to boil. Slowly whisk in the polenta, reduce heat to simmer, and cook, stirring occasionally, about 15 minutes. Stir in garlic and transfer the polenta to a small baking dish. Bake at 350 degrees for about 15 minutes. Prepare the dressing: Whisk or shake tahini, lemon juice, vinegar, honey garlic, and water until well combined. Putting it all together: Toss the roasted beets with the tahini dressing (as much as looks good to you). Cut the polenta into squares. Heat butter in a skillet over medium heat. Pan sear each square, flattening it a bit, about 2 minutes per side. Remove polenta from the pan, and add the greens, stirring until they are nicely wilted, about 3 – 5 minutes. 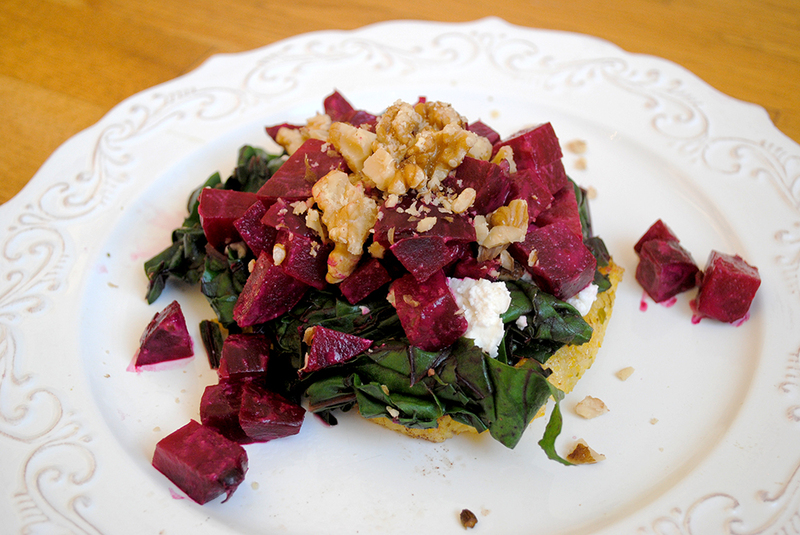 Layer the polenta cake, greens, a few dollops of cheese, a mound of beets, and a sprinkle of almonds. Spread polenta squares in the bottom of an oven-proof skillet. 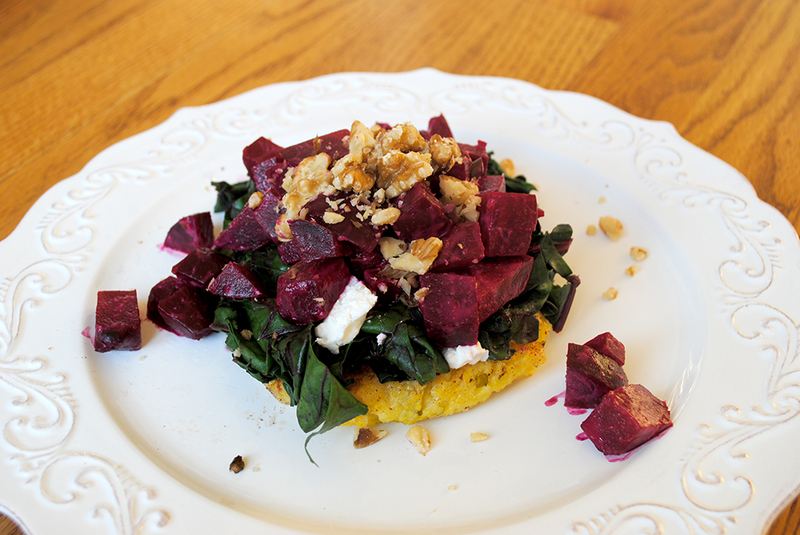 Spread cooked beet greens and roasted beets over top of the polenta. Crumble goat cheese over the vegetables. Whisk eggs, milk, salt, and pepper in a bowl until well beaten. Pour the egg mixture over top. Bake at 375 degrees for 30 – 40 minutes, until set. Finish under the broiler for 2 – 5 minutes, until lightly browned. **When I posted this picture on Instagram, Helene asked me for my “recipe.” The recipe above provides loose instructions for how I used the leftovers from the Napoleon recipe to create a “quiche” of sorts. Perhaps “tortilla” would have been a better description… the egg soaks into the polenta like it would the potatoes in tortilla espanola, but also sits lightly on top, as a quiche would sit in its crust. I had to laugh at your ‘too quickly’ comment. It always surprises me when I cook up cornmeal (polenta is really just Italian for ‘grits’) that all of a sudden you have a thick gloop and nothing else is ready. Loving both of these! They look so elegant!